Near the south edge of Sec.21, T.27 N., R.1 W. & about midway between Sec. 21’s S.W. & S.E. corners. 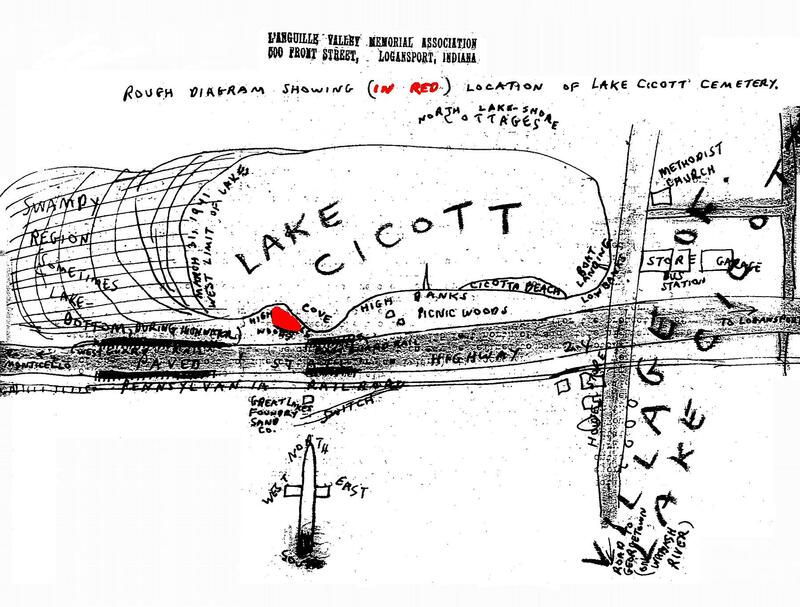 Along the shore of Lake Cicott & the west shore of a cove (or small bay) where the lake extends southward toward the east-to-west State Highway 24 [Monticello to Logansport]. The shore is sandy and steep with a headland towering about 35 ft. above the average lake level. The headland is forested with oak & other trees. About 125 ft. N. [on the south side] of Hwy. 24 is the Great Lakes Foundry Sand Co.’s plant. This plant is served by the PA. 100 yards further east is the PA Railroads switch & runs from ( Logansport-to-Peoria , IL except in times of high water when the lake floods certain swampy lowlands far to the west & south toward S.H.24. that lie west of the cemetery. It floods in such a way that with the bay, the cemetery almost appears to be an island, which lies near the west end at the south shore of the lake. The lake’s recreational facilities are located on the south shore at Cicotta Beach , across the cove to the East. It has a longer headland but is high & sandy & in the summer months is extremely busy unlike the [West] cemetery woods side of the lake which is far more secluded & less frequented even though it is quite near. Looking N.E. from the cemetery is a charming view, overlooking the entire lake, you can see the Methodist church; Jefferson Twp’s. Consolidated school & the entire north end of the little hamlet formerly known as Lakeville but now is Lake Cicott . The pioneers, no doubt, thought this an ideal place to lay to final rest their loved ones at this spot overlooking the one of the prettiest natural lakes in southern Indiana . Partial comments of R.B.W.J. : March 31, 1941, this long-ago abandoned little pioneer cemetery was found to be in a depressing state of total neglect. A deplorable neglected state, nearly all of the stones fallen & scattered. He wandered around the cemetery for quite some time looking for all evidence of other stones & did find one for William A. Wimer (see notes). All of the little old slabs & monuments were down & some of them broken & displaced from the graves they were intended to mark. The fence which surrounded this little cemetery has all but disappeared. HERMAN Christia A. 28 Aug 1840 28 Jan 1861 20 w/o Abram B.
WIMER Caroline 11 Feb 1836 27 Sep 1865 29 w/o J.W. WIMER Frances [Huffman] 16 Feb 1834 19 Nov 1855 21 w/o J.W. WIMER Infant Daughter 24 Sep 1864 8 Oct 1864 14 DA d/o J.W & C.
Nancy Spencer Bell: Wife of Major Daniel Bell. He survived her & remarried. He is buried in The Sprinkle Methodist cemetery in Jackson Twp. [Editorial: Nancy Spencer was a daughter of Captain Spier Spencer who was killed in the 1811 Battle of Tippecanoe [while leading the famous Corydon “Yellow Jackets” against the Indians headed by the prophet Shawnee ]. Nancy was a sister of Matilda Spencer who became the 2nd wife of the famous [U.S. Senator, General, Legislator, Fraternal Leader, Indian Agent, Etc. John Tipton, [who like Bell had served as a “Yellow Jacket”]. The Bells left Corydon and settled in Putnam Co., bet. 1824-1827 but in early 1827 became the First American settlers between the Eel & Wabash River ’s near Logansport . In 1830 they moved to Louison Reserve north of the Eel River near Logansport & in 1835 to near Georgetown [south of the cemetery]. Gary/Gaby: d: 10/07/1852 Aged 2 yrs. An old broken slab & another broken stone says, “R. Caroline” but last name is missing. “Whitsett” comments. That they found a footstone says [“R.C.G.” & questions if this is all one grave, that of Caroline R. Gary, d/o H? & M.A. Gary or Gaby? Civil War Nat. Park Service Soldiers & Sailors: Garey, William H. 46 Reg. IN Inf. There was a William Carey in the Civil War database but he was 17th Ind. Artillary & no middle name H. who was born in IN & lived in Cass Co.
Tam, Lemuel: 1860 USC Jefferson Twp., Cass Co., IN 70 b. Delaware & living in the Isaac W. Thompson home.